The shot tower on the campus of Fort Hayes is a backdrop for a lot of things, but a jobs bill should not have been one of them. Thousands of kids have been in photos in which their parents used the Fort Hayes shot tower as a backdrop. President Obama visited Columbus yesterday with someone, oddly, picking Fort Hayes, where a high school for the arts has now been located, for the venue. I say oddly because Fort Hayes is a better backdrop for a history lesson on the Civil War (like when I snapped this photo of my son) than for a serious talk about jobs. When I heard Fort Hayes was the venue I thought maybe we'd hear remarks about Ohio's role in manufacturing the products that helped the Union win the war and that helped Ohio give birth to a national industrial revolution. I thought maybe President Obama would be talking converting from wartime to manufacturing as a theme to talk about Ohio helping to bring the nation a brighter, industrial future. I thought wrong. 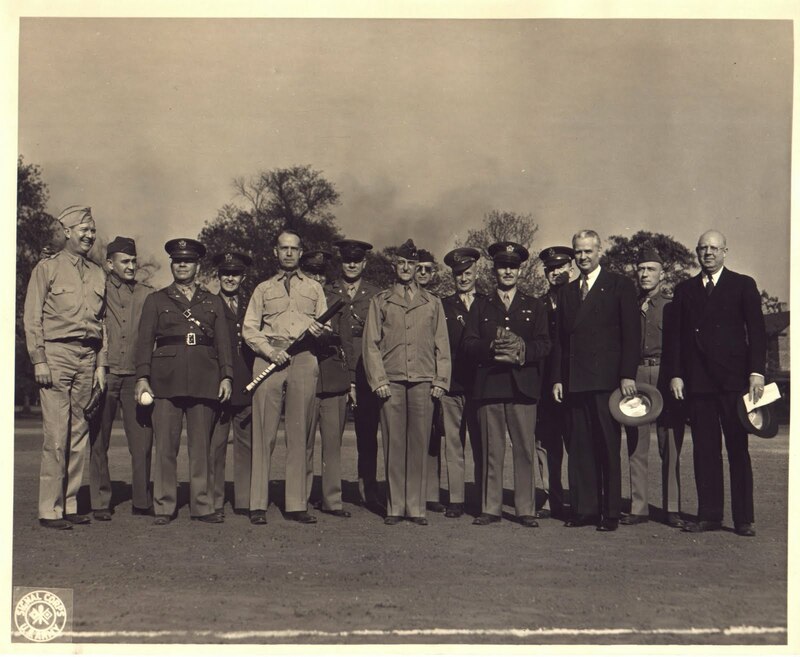 Fort Hayes brought politicians in the 1940's to boost the war effort. That's Governor Bricker holding his hat third from right and Colonel Armstrong (great grandpa to me) holding the ball. My great grandfather, a Colonel in the Army, was commander of a troop intake center at Fort Hayes during World War II. Politicians, like Ohio Governor Bricker, came to visit the Fort to boost the war effort. Maybe Obama was going to talk about conversion of military bases as a yet-unannounced part of his proposed jobs bill, I thought. Guess not. Instead, all I could detect was his mentioning the site's connection to the Civil War as a reference to schools being in old buildings. The reference was a bad one because, in fact, the barracks/offices building behind the President's podium was actually in pretty bad shape a few years ago. It should have been condemned, really. Someone put a lot of money, probably government money, into refurbishing that building. Already. Someone, oddly, chose to put a high school on that campus. Someone, oddly, chose to put money into furbishing old barracks and offices that served the war effort through, at least, World War II but had outlived their useful life. The oddity continued when someone chose the backdrop of a Civil War-era venue in the middle of Ohio to talk about school buildings as a prelude to jobs. Odd indeed. Love that picture of Grandpa Armstrong. It's also easy to see from where some of us got our boyish figures.